It’s not every day that you can enjoy all the benefits of a wonderful bed and breakfast, and a winery too! But that’s exactly what you get at Kite Hill Vineyards, Winery and B&B in Carbondale, Illinois. 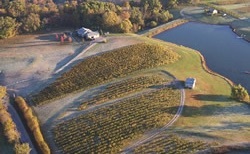 Kite Hill is located on the Shawnee Wine Trail in southern Illinois, in a peaceful setting with a lake and acres of grapevines. Stay here and you can stroll through the vineyards before breakfast or watch the sun set while sipping wine on the patio. It’s relaxing—and a fun place to stay too. After all, how many bed and breakfasts include a wine tasting room? The Kite Hill Winery produces more than a dozen varieties of wine, including whites such as creamy Chardonel and full-bodied Vignoles. Red wines include Cabernet Franc, which has a velvety finish, and a refreshing semi-sweet Red Kite. You’ll also find a rose and blush wine in the lineup. Try a sampling in the Tasting Room, or sign up for one of the events that are scheduled throughout the year, such as a wine and chocolate pairing or a special vineyard tour with the winemaker. For those wishing to stay, Kite Hill offers two guest rooms, each with private baths and queen beds, and serves a delicious three-course breakfast. Check out its tempting packages too—good for when you’re visiting one of the local schools or just looking for a special getaway. Sunday, Monday, Thursday, 12:00 p.m. – 5:00 p.m.
Friday, 12:00 p.m. – 6:00 p.m.
Saturday, 10:00 a.m. – 6:00 p.m.
Saturday – Sunday, 12:00 p.m. – 5:00 p.m.
Kite Hill Vineyards, Winery, and B&B is a member of the Illinois Bed and Breakfast Association … a unique lodging experience! This entry was posted in Food and wine, Illinois Bed and Breakfasts and tagged Illinois Bed & Breakfasts, Wine trail by admin. Bookmark the permalink.